An Arizona witness at McNeal reported watching a boomerang-shaped UFO that appeared to be escorted by two military jets about 9:08 p.m. on September 9, 2014, according to testimony in Case 59707 from the Mutual UFO Network (MUFON) witness reporting database. “There were two jet fighters tailing slightly behind the tips of its wings. I knew they were separate aircraft because they moved independently from the red lights which stayed together and they were not red but more like white/ yellow in color. 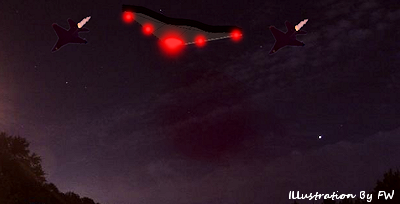 As the object and jets passed over I could see the jets had blinking aircraft lights – like you see on all aircraft.” . . . Fighter Jets Chasing UFOs in Florida Skies?